Low-cost carrier Norwegian Air is to begin two new flights between Northern Ireland and the United States. Services will operate five times a week, from July, between Belfast International and airports in the New York and Boston areas. 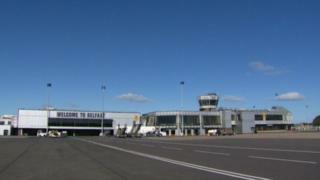 Aldergrove said it was "the best possible boost for Northern Ireland". It has been working to find a replacement for United Airlines, which ended its daily New York service in January. United had claimed the Belfast-Newark route was not profitable enough. Norwegian Air will fly to Stewart International Airport, about 70 miles from New York, and TF Green Airport, 60 miles from Boston. It will use a new Boeing 737 MAX aircraft. Its chief executive, Bjorn Kjos, said: "We are delighted to announce our first ever flights from Belfast and to ensure the city maintains its crucial transatlantic links. "The cost of transatlantic travel has been too high for too long, so by connecting Northern Ireland with smaller US airports we can offer some truly affordable fares." Earlier this year, the then Economy Minister Simon Hamilton told the assembly he had agreed an undisclosed aid package to back the new routes. Graham Keddie, managing director at Belfast International Airport, said: "We have been working with Norwegian and government agencies to get this project across the line." Norwegian will do three flights a week to Stewart and twice a week to TF Green.